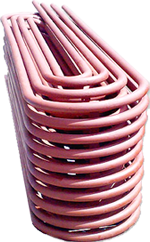 We are the leading manufacturers of Coil Type Heat Exchanger in India and We also offer helical coil type heat exchanger which is highly demanded. We are An ISO 9001-2008 certified Designers, Manufacturer & Exporter of all types of Heat Exchangers & Cooling Towers in India, Established in the year of 1989 and JC Equipments standards such as ISO 9001-2008 (High Quality). Coil type heat exchangers are more well-organized than shell and tube exchangers for low flow rates and this type of heat exchanger in all Industries. Mostly used in higher-pressure and Higher Temperature applications and its very high efficient and quality Coil type heat exchangers use in a many number of applications. Designs methods develop the software of the industries purposes. Coil Heat Exchangers are having specialized software for thermal design with good making. Our design team is very updated knowledge of heat exchanger designs and manufacturing methods create the software of the industries purposes. Coil type heat exchangers use in a many number of applications. Mainly used as condensers or coolers.